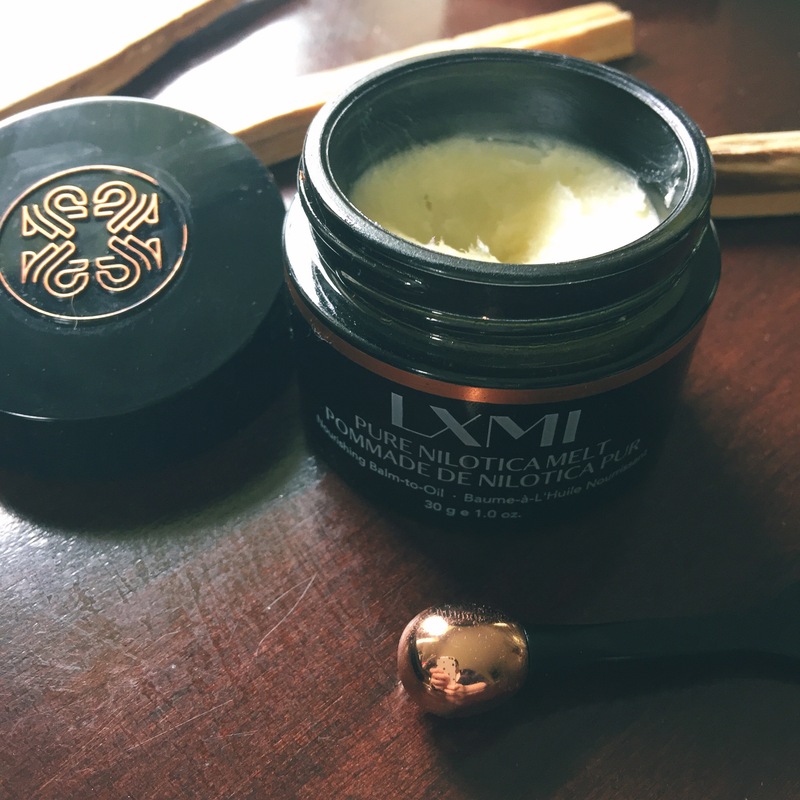 I’m so thrilled to introduce you to a brand called LXMI (pronounced luxe-me) that I’ve discovered that is completely dedicated to organic beauty AND is making a positive social impact along the way. The Founder, Leila Janah, has searched the world for rare, organic ingredients that work for your skin and give work to women in need. USDA-certified Organic Nilotica Reserve, which is a rare relative of Shea. You don’t see this particular ingredient used very much in the skincare industry because of the sourcing challenges and related costs. As someone who has been a HUGE lover of all things Shea, I will be honest that when I first heard of this, I figured it would be just like most Shea products I have tried. WRONG. It is unlike anything else I have ever tried. Nilotica (NILE-ot-i-kah) is pressed into a soft butter unlike many other botanicals that are tpyically pressed into an oil. The microcrystals found in this melt dissolves on the skin immeditely and is SUPER rich and hydrating without ever feeling heavy on the skin. Fatty Acids: These are the building blocks of healthy cell membranes and will help protect the skin’s natural oil barrier. The benefit? Your skin will look and be more hydrated, plumper, and younger looking. Allantoin: Encourages skin to shed dead skin cells and grow new ones. The benefit? Will help to promote healthy cell development and prevents dull skin, and will moisturize and heal. Vitamin A: Is known to thicken and stimulate at the dermis level (where collagen, elastin and blood vessels are located). The benefit? Will increase blood flow to the surface of the skin and can help to reduce the appearance of fine lines. 96% showed an immediate improvement in visible fine lines, wrinkles, skin texture and smoothness. I stir the Melt with the copper-tipped wand. By the way, I am obsessed with this wand is the perfect accessory and delivers the exact amount of product needed. 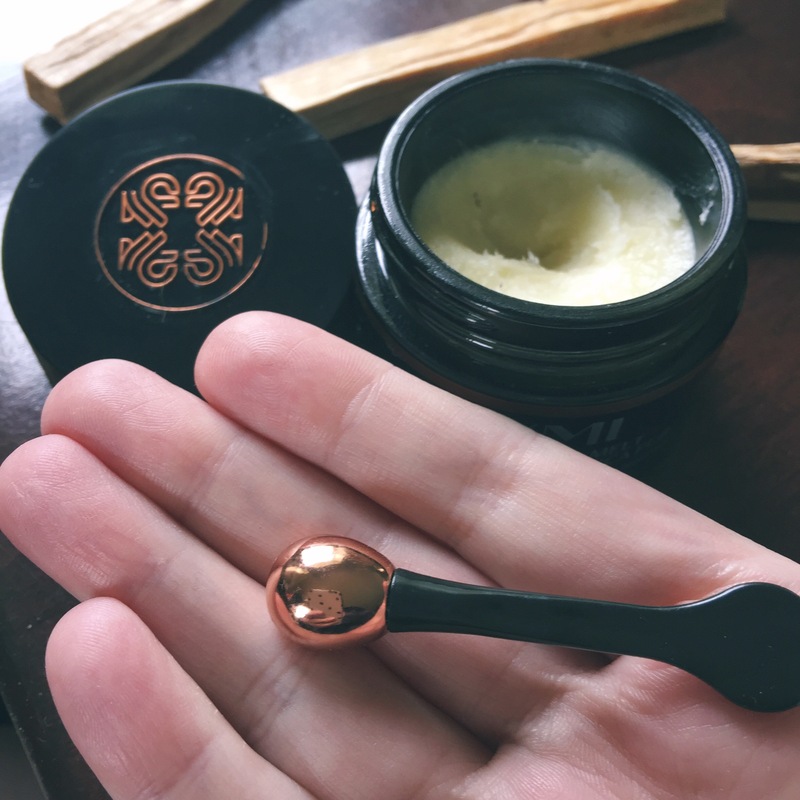 One side is for scooping and the copper ball tip is for evenly distributing the product across your face and decolletage. It feels so refreshing and it stimulates the skin as you move the copper ball tip around. I’ve noticed it’s helped with the puffiness around my eyes in the morning. I prefer to use Nilotica at night as part of my beauty ritual. During the day, I use it under my eyes, around my nose, on my lips and cheeks (for a glow) and even use it on my cuticles. You can also use this product as an overnight facial treatment for intense hydration. Because this special product has 25 percent more essential fatty acids versus traditional beauty oils, your skin will feel so plump upon awakening. Each box containing your precious Pure Nilotica is numbered printed on the inside, with a date of the harvest, location, and the wages paid to the harvesters. There is a “Harvest Number Search” here where you can literally read all about the details of your own jar! It’s very important to me that a brand is socially responsible all through the process from sourcing the ingredients to the final packaging. LXMI has built their supply chain via non-profit collectives. They believe in fair wages, dignified employment, which results in a higher level of luxury product. They provide living wages to help Ugandan women support themselves and their families with integrity. With innovative products like Nilotica Reserve and also their Cream, expect to see more in-depth reviews from me about this elite eco-luxe collection! You can purchase Nilotica here for $48. This post was sponsored by LXMI through WTS Connect. As always, all opinions are my own. I sometimes share affiliate links, but I will never recommend any product, brand or store unless I use and love them myself. I only make a small commission if items that are ordered directly through affiliate links are purchased. These sales help me to keep pursuing my passions and to be able to try more products to test out and recommend to all of you! So if you buy through my links, thank you so much! I provide coupon codes whenever I can to try and help you save money. I am never paid for any positive reviews and will always give my honest opinion. A lot of people may think these balms are too heavy or thick but it’s the total opposite. These pure and rich oils help the skin in so many ways. I have dry/combination skin and this works wonders for me that you never can tell my skin is dry. May not be for everyone but worth a try if you’re curious. Sounds like a great investment, plus it smells like vanilla:) perfect ! Thanks for sharing .